Now with our convenient KidSafe Wellness Roll-On Sampler Set, keeping your kids healthy and happy is even easier! We know how tough seasonal threats can be on little children and families and we know how tough it can be getting started with essential oils. That is why we created our KidSafe Wellness Roll-On Sampler Set. Including our three most used KidSafe synergies for seasonal threats, this set will help you be ready for anything that might come your way. Check out our KidSafe Complete Roll-On Set for even more of our favorite KidSafe pre-diluted roll-ons! SET INCLUDES 100% PURE, PRE-DILUTED ROLL-ON SYNERGIES OF: Germ Destroyer, Immune Boom and Sniffle Stopper. FOR MORE USAGE IDEAS: please visit the individual product pages of Kid Safe Pre-Diluted Roll-On synergies of Germ Destroyer, Immune Boom and Sniffle Stopper. 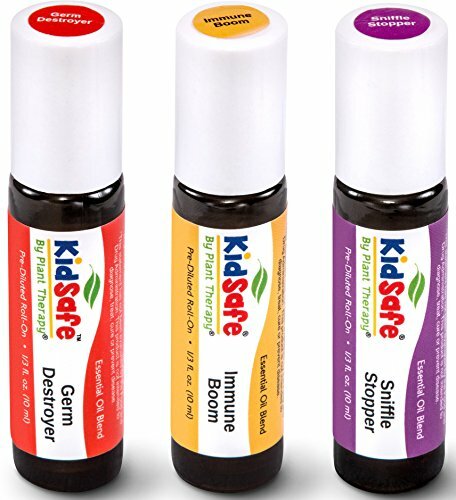 KIDSAFE BY PLANT THERAPY - the first-ever essential oils developed for children. Formulated by Robert Tisserand, Kid Safe synergies target common childhood issues and ailments. Each comes as a 100% pure, undiluted synergy or a pre-diluted roll-on. If you have any questions about this product by Plant Therapy, contact us by completing and submitting the form below. If you are looking for a specif part number, please include it with your message.